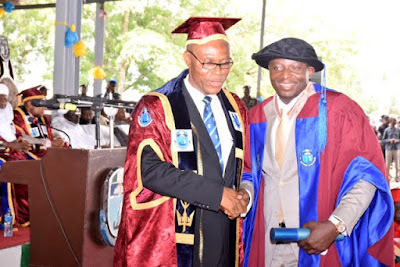 Akpobolokemi earned his doctorate degree in Strategic Marketing Initiatives and Business Performance of Nigeria Maritime Sub Sector from the Management Sciences Faculty of the university. 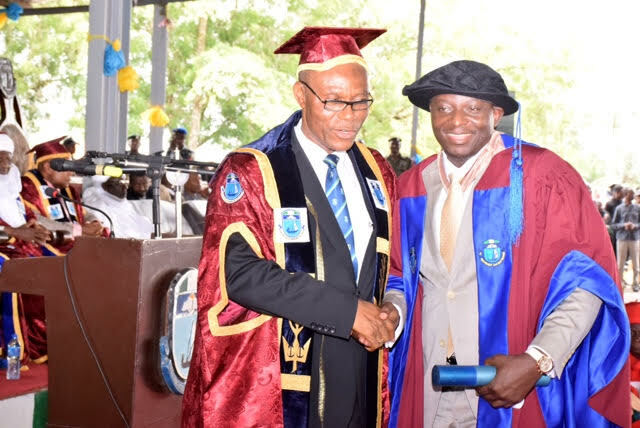 Shortly after his conferment, Dr Akpobolokemi thanked the University for providing a conducive environment for him to continue his academic quest in order to strengthen his capacity to provide service to the Maritime sector. He explained that his area of speciality provided him valuable insights as his research documented the best practices in strategic Marketing Performance Management (MPM) based on the survey results of various firms and institutions in the Maritime sector locally and globally. The convocation ceremony also witnessed the installation of the Emir of Gwandu, Alhaji Muhammad Iliyasu Bashar, who is a retired Major General, as the Chancellor of the university. The visitor to the University, President Muhammadu Buhari, who was represented by Prof. Julius Okojie, Executive Secretary of Nigerian Universities Commission (NUC), promised that education would receive the needed budgetary allocation under his administration. While describing the education sector as key to national development, President Buhari noted that the goal of his administration would be to provide new facilities, rehabilitate and upgrade existing ones in order to ensure that learning, teaching and research facilities are constantly upgraded and updated to compete with other global institutions.